Disney's Beauty and the Beast: The Broadway Musical for Guitar, Piano/Keyboard, Vocal, Piano/Vocal/Guitar. Vocal Selections. Broadway and Disney. Difficulty: medium. Songbook. Vocal melody, piano accompaniment, lyrics, chord names, guitar chord diagrams and color photos. 152 pages. Published by Hal Leonard (HL.312511).ISBN 0793535646. With vocal melody, piano accompaniment, lyrics, chord names, guitar chord diagrams and color photos. Broadway and Disney. 9x12 inches.Features piano/vocal/guitar arrangements of 21 songs by Alan Menken, Howard Ashman and Tim Rice from this Disney Broadway smash, including Be Our Guest, Human Again, Something There and more. 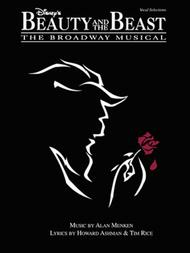 Disney's Beauty and the Beast: The Broadway Musical composed by Alan Menken, Howard Ashman, and Tim Rice. For Piano. Easy Piano Vocal Selections. 120 pages. Published by Hal Leonard (HL.316039).ISBN 0634000632. 9x12 inches.Features easy piano arrangements of 14 songs by Alan Menken, Howard Ashman and Tim Rice from this Disney Broadway smash: Be Our Guest • Beauty and the Beast • Belle • Gaston • Home • How Long Must This Go On? • Human Again • If I Can't Love Her • Maison des Lunes • Me • The Mob Song • No Matter What • Something There • Transformation/Beauty and the Beast (Reprise).